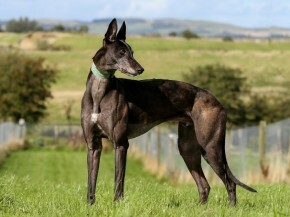 SPARKY is a small black male greyhound who has a small flash on his chest and white rear feet. He is another live-wire who is full of energy and loves his time outdoors. He gets very excited when he knows it’s time for walks and is desperate to get started. He will be strong on lead initially but will calm down after a while with firm but positive handling and encouragement. He gets on well with his kennelmate Beauty although he can be a bit dominant at times. He is a real foodie and will do anything for a treat, a fact which may help in his training. He needs housetraining but this should be straightforward with a frequent and regular toilet routine as he settles into his new home. He is a lovely boy who would be at his happiest with lots of play and outdoor activities. He would be a joyful addition to any family with time to devote to making sure his energetic needs are met.